edited by James E. Person Jr.
University of Kentucky Press, 2018.
Letters are often an intimate look into the details of a person’s life and musings, so whenever the letters of a respected historical figure are published, the reader is given a unique gift. 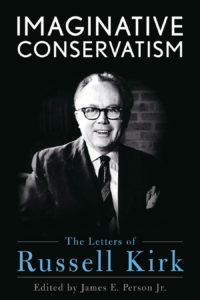 Imaginative Conservatism: The Letters of Russell Kirk will probably not serve to drastically change one’s opinion of Russell Kirk (1918–1994)—there are no bombshell discoveries to be made of secret lovers or devious plots to take down political adversaries. But for those who have admired him, Kirk will be appreciated all the more. For those who have disagreed with Kirk’s ideas, his letters will at least show the foundations upon which those ideas came to fruition. Imaginative Conservatism will be of primary interest to fans of Russell Kirk and those interested in the history of twentieth-century conservative thought. Kirk was one of the foremost voices of American conservatism and this look into his personal correspondence is invaluable to understand the man and the movement. The average reader may find the details of travel, publishing, and meetings to be laborious at times, and yet scattered throughout the day-to-day correspondence are fascinating tidbits about Kirk’s worldview, dreams, and plans that one can now see in hindsight as either wildly successful or of no significance. Kirk wrote many books and articles, edited magazines and journals (to include The University Bookman), and his letters serve as one example of his industriousness. The letters show the development of Kirk’s thoughts and values over six decades. Kirk underwent change through the years, but perhaps less than might be expected. He was extraordinarily wise, even a bit brash, and sometimes unsure of how to proceed in his younger years. Yet Kirk seemed to have already formed strong opinions in the 1940s that remained with him even into the 1990s. A clear progression is observable throughout the letters, beginning with worries about travel, school, the war, and his future, and maturing into a wise thinker with extraordinary gifting, insight, and influence. If you will forgive such an answer to your courteous letter—I am afraid I scarcely see eye to eye with you people … On particular issues we are very close; on philosophical postulates, a great gulf is fixed between us. I never call myself an individualist; and I wish that you people hadn’t clutched that dreary ideology to your bosom. Politically, it ends in anarchy; spiritually it is a hideous solitude. I do not even call myself an “individual”; I hope I am a person. I am all in favor of individuality, and all against individualism. In 1982, Kirk responded to a negative review of his Portable Conservative Reader wherein the reviewer called the work boring. In his letter to the editor, Kirk responded with sarcastic punch: “Among those dull contributors are Coleridge, Fenimore Cooper, Macaulay, Hawthorne, Stevenson, Gissing, Saintsbury, Conrad, Christopher Dawson, Eliot, C. S. Lewis, Betjeman, Freya Stark, Jacquetta Hawkes, Muggeridge. Whatever such authors may be accused of, never before have they been found dull. Who are the lively political writers favored by [the reviewer], of the deathless prose?” But Kirk wasn’t afraid to receive criticism, either. In a 1978 correspondence with Dr. Thomas Howard he asked that his book Decadence and Renewal in the Higher Learning be reviewed, explaining, “If you can undertake this, be as cruel to the book as you like”! As a writer and editor, Kirk knew the importance of thick skin. It’s difficult to read Kirk’s letters without wondering what he would think about the political discourse of 2018. By the 1960s, a few of Kirk’s letters offered prophetic insight into what was to come. He saw a rotting of the foundation of Western culture fifty years ago that would lead to the situations so many of his disciples bemoan today. Kirk would be disappointed, but probably not surprised that by 2016 a man would be a serious contender for the office of President as a self-avowed socialist. As early as 1963, Kirk wrote of conservative thinkers that, “The odds are against us,” and yet remained optimistic that “There remains in this country a large body of support for an imaginative conservatism … we may succeed in saving a good deal from the wreck of the modern world.” The problem as Kirk described it was that “the great mass of men are moved only by self-interest and prejudice. Of that small minority who think seriously about the problems of the society, most are badly schooled.” In 1994 Kirk lamented, “In Chicago, as in every large American city, the crust of culture is thin and various ideological follies are eating away at it.” Kirk was seeing the very tip of the iceberg. Nicholas Kennicott is a pastor in Georgia, a PhD student at Faulkner University, and the author of In Praise of Old Guys: Pastoral Mentorship, Humility, and the Dangers of Youth.